Everyone knows my addiction to Tim Hortons Iced drinks but finally I have found a hot drink – the new Dark Roast blend that I tried in an enhanced tasting experience by the brand highlighting the full, rich profile of the new coffee blend…in the dark! I usually don’t go all the way to the other end of Dubai for such tastings but it was organised by an awesome PR agency, Percept Gulf who were very persuasive and is the best agency that Apparel Group uses so I made the effort – I am glad I did. 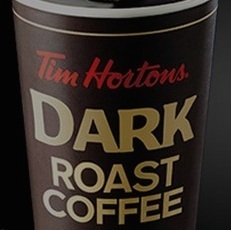 Tim Hortons Dark Roast is a brand new premium blend made from 100 per cent Arabica beans, sourced from the world’s most renowned coffee regions….which is why it was great for a kick start when I started trying it in the mornings the last 2 months instead of my normal iced coffees. The new dark blend offers hints of citrus, cocoa and earthy tones with a rounded body. It is carefully roasted to bring out the full, rich flavour and aroma of a dark roast coffee, while ensuring a perfectly smooth finish. For someone who always drinks iced coffee, this is a nice change for me and I am loving it.